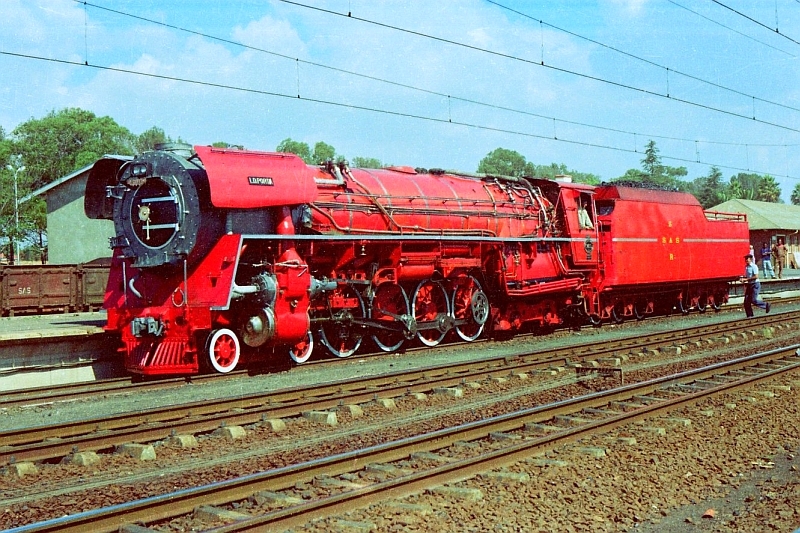 Better known as "The Red Devil" because of its bright paint job, this 4-8-4 showed that 1950's steam had by no mean reached the limits of performance. It was developed from an existing class 25NC 4-8-4 by David Wardale of England along the principles advocated by L. D. Porta. Wardale came to work in South Africa in 1974 and was given a minor position in the Chief Mechanical Engineer's office with the South African Railways (SAR). As a steam enthusiast, he sincerely believed that South Africa was making a serious mistake by scrapping their steam fleet even as fuel oil prices were increasing and availability was becoming shaky. From his lowly post, Wardale repeatedly made suggestions to his superiors that steam improvements should be considered, evidently to no effect. Finally, under the pretense of reducing its tendency to start line-side fires, he was allowed to make modifications to a Class 19D 4-8-2. Wardale knew that the GPCS could accomplish this, while greatly increasing the power and economy of the locomotive. Working by himself at SAR, with some long-distance assistance from Porta, Wardale undertook to modify 19D no. 2644. Modifications were limited because they had to be fabricated and installed at a running shed, which had limited time and resources. A GPCS and dual Lempor exhaust were installed on the engine, along with some other small improvements. As this was Wardale's first attempt at modernizing a steam locomotive, there were understandably a few "teething" troubles that had to be overcome. Nevertheless, after a few weeks of "tuning up" and minor modifications, the locomotive proved capable of significantly higher power and significantly lower fuel consumption than other 19D's. Several "official" names were given to the locomotive, but the crews had their own name for it: "Spooky". This was partially in reference to its quieter exhaust and partially in reference to its unearthly performance. With some solid proof to back up his claims to his superiors of steam's untapped potential, he eventually was allowed to make more-extensive modifications on a bigger locomotive. South African Railways Class 26 No. 3450 "L. D. Porta"
Wardale started with an SAR Class 25NC 4-8-4 locomotive, no. 3450. The 25NC's (and their condensing brothers, the 25C's) were generally considered the most modern steam locomotives operating in South Africa, and on par with the most modern steam locomotives ever built. They were equipped with large boilers, cast bed engine frames, roller bearings on all axles and rods, and extensive mechanical lubrication. The 25NC's were basically modern U.S. 4-8-4's scaled down from 4 foot 8-1/2 inch gauge to the South African 3 foot 6 inch gauge. Their only deficiencies compared to U.S. steam were relatively low boiler pressure (225 PSIG) and the lack of a feedwater heater. By improving what was already considered to be an advanced steam design, Wardale hoped to prove that there was a great deal of untapped potential in even the most modern steamer. Doing most of the design work himself, with some minor assistance from a couple of other engineers, Wardale designed more-extensive improvements for this engine. The Red Devil was equipped with the GPCS, improved piston valves, enlarged superheater and steam chests, double Lempor exhaust, a feedwater heater, and other improvements. While the improvements sound extensive, they were greatly limited by the existing structure of the locomotive and the time and money allocated. Boiler pressure could not be raised, only minor changes to the steam chests could be accomodated, and parts had to be adapted from other existing locomotives (such as the superheater header from a GMAM Garratt). Once again, after a trying period of fine-tuning, the Red Devil began to show hints of the true performance potential of steam. In service, the 3450 showed over a 38% reduction in fuel costs per ton-mile compared to the standard 25NC's. Sustained drawbar horsepower readings of over 4000 HP were attained in testing (significantly more than developed by the MUCH larger C & O 614 while burning much better coal in later testing), thought to be the world record for a narrow gauge steam locomotive. Roger Waller (later of the Swiss Locomotive Works) came to South Africa about this time and assisted with testing of the locomotive. Despite the outstanding performance of no. 3450, however, the South African railways proceeded with the quick retirement of their steam fleet. "Management" had already decided that steam must go and any opinions (or scientic proof for that matter) to the contrary were barely tolerated. Even as the tests of no. 3450 were being conducted, it was obvious that steam was in decline. Great difficulty was caused by poor workmanship on some repairs and by the decreasing quality of coal. The momentum of 35 years of stagnation in steam locomotive development was too much for Wardale to overcome. When it became clear that no duplicates of no. 3450 would be constructed, Wardale left South Africa to pursue other opportunities, and was soon contacted by some crazy Americans with some ideas for coal-burning locomotives. See the ACE page for details. In recent years, steam in South Africa has been relegated to a few industrial lines and special events. 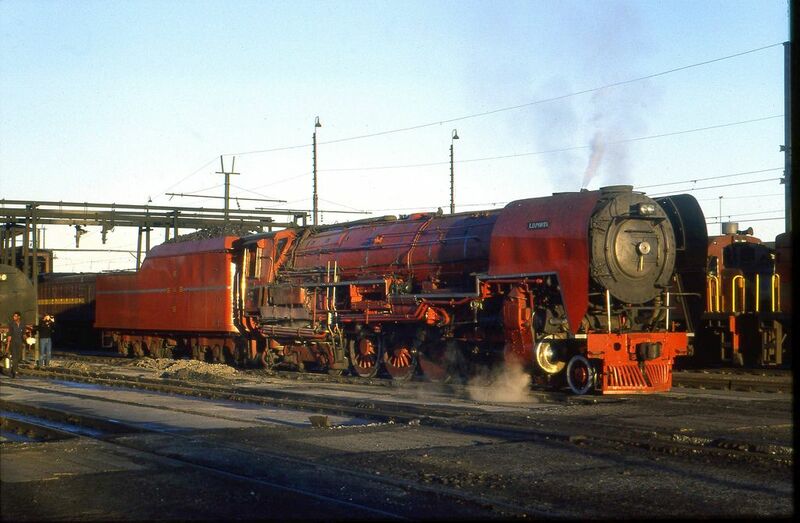 The Red Devil was unfortunately significantly de-modernized as steam maintenance standards declined. On a brighter note, the Red Devil was overhauled in 2018 and will be used on passenger excursion trains in the future. 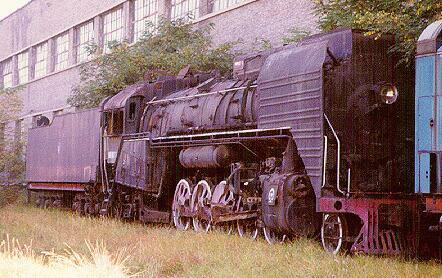 In 1985, after the ACE project had failed to secure funding in the U.S., Ross Rowland from the ACE team went to China to try to persuade them to produce new modern steamers for their own use as well as export. After hearing Rowland's proposal, the Chinese next called in M. Thorp of Steam Locomotive Designs, Limited of England. David Wardale had been hired by Thorp after he left ACE and had worked with him to develop a series of proposals for modern or modernized steam locomotives. One of the locomotives proposed was a 2-10-2+2-10-2 Garratt shown above. The Chinese expressed interest in the proposal to develop an improved QJ 2-10-2 locomotive design, but made no firm commitment. Some time later, the Chinese contacted Wardale directly and hired him to work with the Datong Locomotive Works to develop an improved QJ design, as well as possible improvements to existing locomotives. As his book reveals (see below), Wardale spent a very frustrating time working at Datong with a group who evidently had no interest in the project. It appears that one faction of the government (the Ministry of Energy) was very interested in maintaining China's use of internal resources, one of which was coal. Unfortunately, the Ministry of Railways, like most western nations, had already determined that diesels and electrics would be purchased and steam phased out. Mr. Wardale has very few kind words for the Datong Locomotive Factory, a place many of us considered a "holy" steam shrine as it was one of the last places for the commercial fabrication of steam locomotives on the planet. Besides a complete set of design drawings for a vastly improved QJ2, the only evidence of Wardale's efforts is no. 8001 shown here, which was equipped with the GPCS. The locomotive also features a Chinese "oval exhaust", which was basically a copy of the Giesl design. The no. 8001 was used as a test bed to refine the configuration of the GPCS for Chinese service. If built, the improved QJ2 would have had a triple Lempor exhaust, roller bearing axles and rods, improved balancing, improved valves, and higher superheat. The new design would have corrected numerous faults in the existing QJ fleet which Wardale uncovered in his study of the locomotives. Because the Chinese railways decided to discontinue steam production, mainline locomotive construction ended in China in the late 80's, and existing steamers were gradually replaced by diesels and electrics. Branch-line steam locomotive production appears to have ended in 1997 in Tangshan, although assembly of new SY's continued for a few more years in Changchun. While mainline steam in China is long gone, steam still serves on several industrial railways even in 2018. After this, Wardale retired from active steam work, disheartened by the decline of main line steam around the world. Fortunately, he wrote a book documenting his efforts, The Red Devil and Other Tales from the Age of Steam, which I highly recommend to anyone interested in steam locomotive engineering. Beginning around 2002, Wardale began serious work on the design of a new steam locomotive for excursion service in the UK and elsewhere. First mentioned wistfully in his book The Red Devil, what began as seemingly idle speculation by Mr. Wardale grew into a full-blown, serious project to design and build a new steam locomotive. From its initial mention in Wardale's book, the concept was elaborated upon in the September/October 2000 issue of the magazine "Locomotives International". The project gained momentum and a website was formally established sometime afterwards. 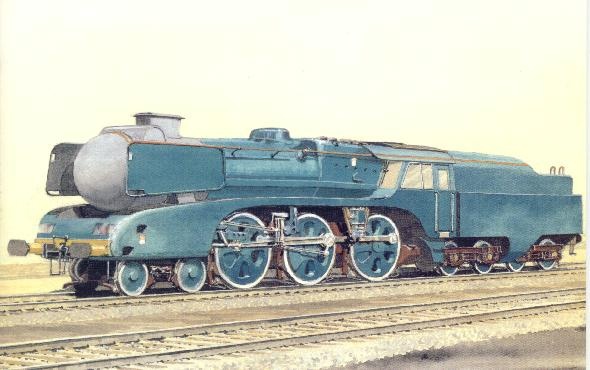 While based on an existing design (the British Railways Class 5 4-6-0), the locomotive was to be an all-new design which would have gone a long ways to show the true potential of a fully engineered "classical" steam locomotive. This locomotive was intended to be capable of regular 100 MPH operation to fit in with existing British passenger schedules. The design progressed steadily over several years and significant headway was made, but unfortunately it became apparent no funding was forthcoming to construct the locomotive. In 2012, the 5AT Project was shelved and Wardale resumed his well-earned retirement. Artist's concept of the proposed locomotive. Note semi-streamlining, dual Lempor exhaust, feedwater heater, "Boxpok" drivers, lightweight roller bearing motion, enclosed cab, and "clearview" tender among other innovations. Following the shelving of the 5AT Project, a new group was formed from the ashes of the 5AT Project, the Advanced Steam Traction Trust (ASTT). The ASTT has been involved in several other projects, including the design and fabrication of a Lempor exhaust for Keighley and Worth Valley Railway's (KWVR) S160 2-8-0 No 5820, and development of a study with recommendations for updates to the design for the Clan Project, a UK group recreating a 1950's design 4-6-2. The ASTT remains active in promoting advanced steam traction.